IT'S A "BIG NIGHT FOR SMALL PINTS"
IT’S A BIG NIGHT FOR SMALL PINTS! 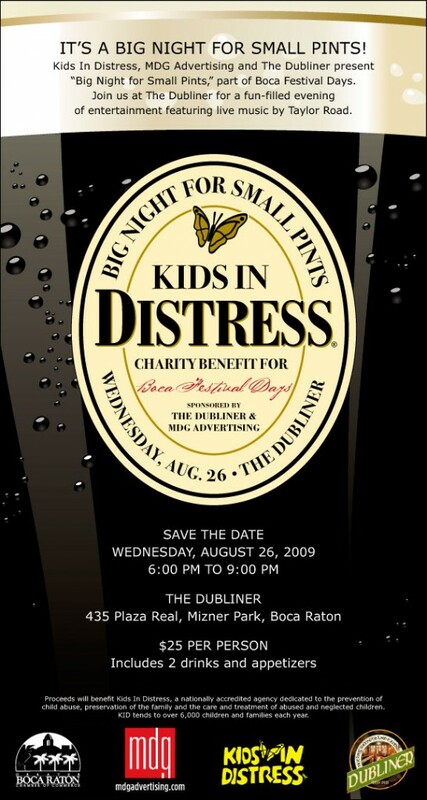 Kids In Distress, MDG Advertising and The Dubliner present “Big Night for Small Pints,” part of Boca Festival Days. Join us at The Dubliner for a fun-filled evening of entertainment featuring live music by Taylor Road. Proceeds will benefit Kids In Distress, a nationally accredited agency dedicated to the prevention of child abuse, preservation of the family and the care and treatment of abused and neglected children. KID tends to over 6,000 children and families each year.